Note2: This example is included, and has been significantly extended to demonstrate further features, in the examples bundle included in the package downloads. Right click on the project just created and select ‘Properties‘. 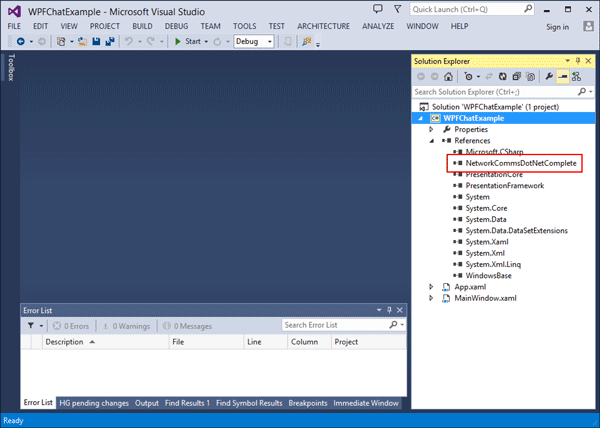 Ensure the ‘Target Framework‘ is ‘.NET Framework 4‘ and not ‘.NET Framework 4 Client Profile‘. You should now have something that looks like this. The NetworkComms.Net download package contains DLLs for all supported platforms but we are only interested in the Net40 > Release > Complete DLL. Copy this DLL to the same location as the solution we created in step 1. We now need to add a project reference to the NetworkComms .Net DLL we just added. Right click on the ‘WPFChatExample‘ project and select ‘Add Reference…‘. Within the window that opens select the Browse tab and select the DLL we just added. 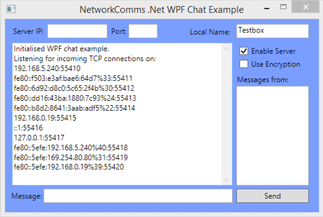 ‘WPFChatExample’ WPF application containing a reference to the complete NetworkComms .Net DLL. The open ‘MainWindow.xaml’ file showing both ‘Design’ and ‘XAML’. 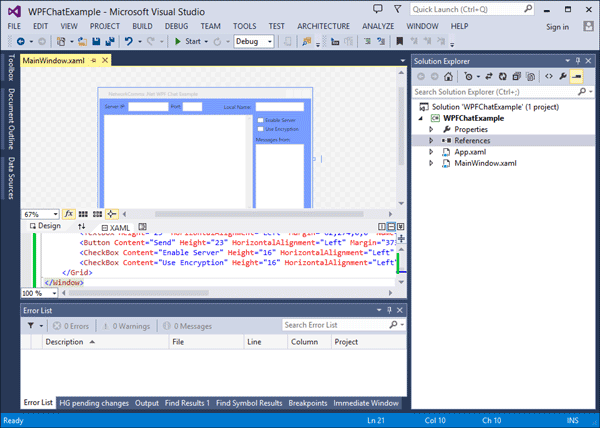 After Copy and Paste of the example xaml code the design window should now show the basic layout. Press ‘F5′ on your keyboard to ensure that the project builds successfully (i.e. 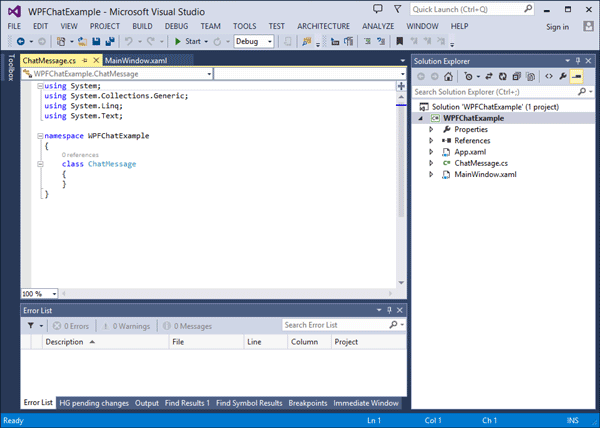 the Errors List window in Visual studio remains empty). If the project does not build at this point please go back over this tutorial and make sure you have completed all of the necessary steps. 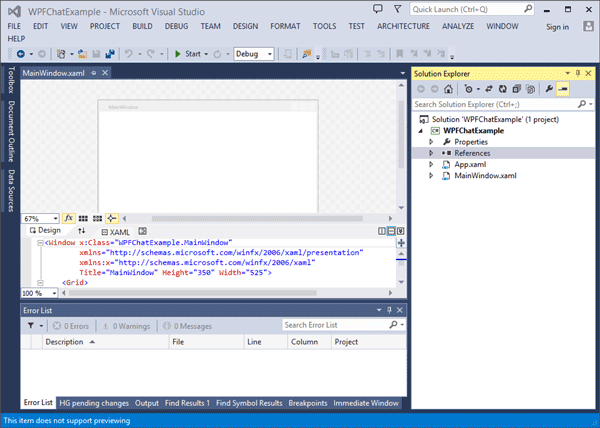 If the project does build you should now see the WPF application, although of course, we still need to add all of the functionality. 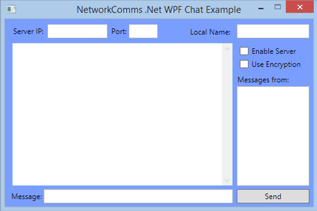 The WPF chat application example. All of the layout elements have been added but lack any functionality. The new class, named ‘ChatMessage.cs’. This will be used as the wrapper for the chat messages. /// A wrapper class for the messages that we intend to send and receive. /// serialisation is performed by protobuf.net. /// The source identifier of this ChatMessage. /// We use this variable as the constructor for the ShortGuid. /// The name of the source of this ChatMessage. /// We use shorthand declaration, get and set. /// has an incrementing index. /// The number of times this message has been relayed. /// We must include a private constructor to be used by the deserialisation step. The most recent messages we have received. The maximum number of times we will relay a message. A local index we will use when sending new messages. /// An optional encryption key to use should one be required. /// for both sender and receiver. /// Append the provided message to the chatBox text box. //we need to wrap the append within an invoke action. /// Refresh the messagesFrom text box using the recent message history. /// Send any entered message when we click the send button. Print the message to the ChatBox text box. Update the Messages From text box. Relay the message to other peers. //relay to all working connections. /// Performs whatever functions we might so desire when an existing connection is closed. //include the source name in the disconnection message. //We clear the text within the messageText box. //We perform the send within a try catch to ensure the application continues to run if there is a problem. Set the default Local Name to our machines hostname. Trigger the method ‘HandleIncomingMessage‘ when we receive a packet of type ‘ChatMessage‘. Trigger the method ‘HandleConnectionClosed‘ when an existing connection is closed. The final step in the application is to add the necessary events so that the buttons and text boxes in the layout can be used to send messages. This is done by editing the XAML of the MainWindow. This is the same XAML edited in step 3 of this tutorial, but to recap, access the XAML by double clicking ‘MainWindow.xaml‘ in the Solution Explorer window. That’s it. We are now ready to see our hard work in action. We’ve finally arrived at the testing phase. We now want to open at least two instances of the WPF Chat Application. 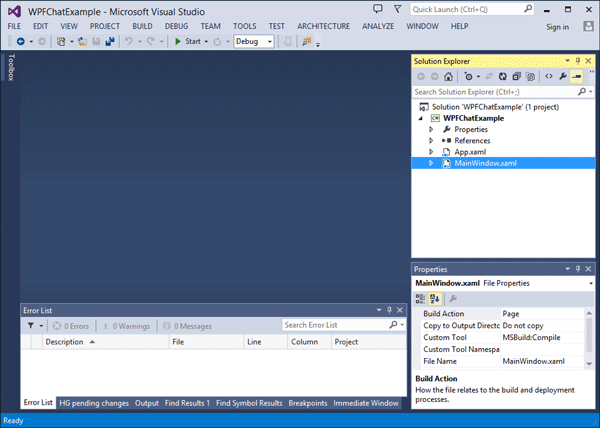 To do that we first need to build the project in debug mode (make sure Visual Studio shows ‘Debug‘ in the top menu), either by right clicking on the solution and selecting ‘Build Solution‘ or pressing ‘F6‘ on the keyboard. You should now see an executable named ‘WPFChatExample.exe‘, double click on this twice to open two instances of the example. Note: When you open the applications you may get a notification from your system firewall. It is important to provide the necessary permissions (see firewall documentation) otherwise the examples will not be able to communicate. Example output of the completed application after the local server has been enabled. Choose an appropriate server IP address and port (generally 127.0.0.1 or 192.168.*. *) from the output shown in application A and enter this information into the other application (application B). Now enter a message into application B and click send or press enter. The message will now appear on both applications. Once the connection has been established in this fashion a message can now be entered in either application and it will appear on the other. The most basic connection configuration. Application B has selected application A as its server. Another basic connection configuration. Application B has selected application A as its server. Application C has also selected application A as its server. A more advanced connection configuration. Application B has selected application A as its server. Application A has selected application C as its server. The most advanced connection configuration using three clients. 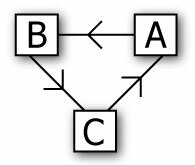 Application A has selected application B as its server. Application B has selected application C as its server. Application C has selected application A as its server. See our Getting Started or Basic Client Server Application articles.